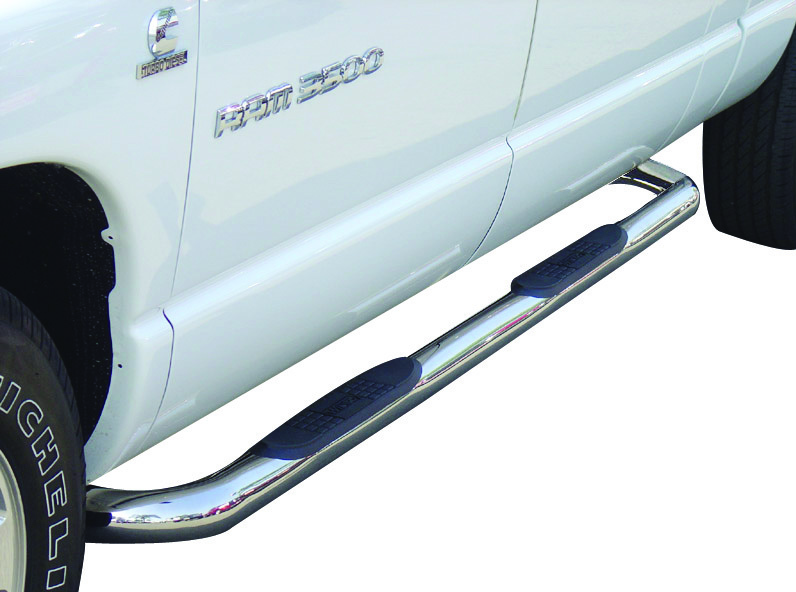 The 3" Round Tube side steps were designed to compliment any vehicle. A basic and economical choice to help getting on and off the vehicle is what a 3" diameter round tube step is about. It provides sufficient weight capacity, anti-slip pads, and decent appearance on SUVs and pickup trucks. The need for side steps has also grown significantly to help make it easier when entering and exiting the vehicle, as well as adding the element to your great looking vehicle. This tubular side step provides great functionality with a wide step area, and a high quality, UV-resistant, non-slip surface. With an easy installation, these 3” Round Tube side steps offered by TrailFX and Westin can be applied to a wide range of SUVs and pickup trucks: Acura MDX, Chevy Colorado, Equinox, Silverado, Traverse, Dodge RAM, Ford Explorer, F150, F250 F350 Super Duty, GMC Acadia, Canyon, Sierra, Honda CR-V, Pilot, Ridgeline, Jeep Grand Cherokee, Wrangler, Nissan Frontier, Rogue, Pathfinder, Titan, Toyota 4Runner, Highlander, RAV4, Tacoma, Tundra, and many more. Each of these products are made from either 304 marine-grade stainless steel or black powder coated mild steel to keep your vehicle looking clean, sophisticated and protected against the terrain. If you’re in need of 3” Round Tube side steps, look no further than AutoEQ.ca! We have warehouses located throughout Canada to provide our customers with superior and efficient service, including free shipping! Hop online to order your side step today.